At the University of Pennsylvania, where I teach memoir, I’ve started a tradition. “Memoir of the week,” I’ll announce, toward the end of each class, and then proceed to pull from my big bag of tricks a memoir that seems to break “traditional” memoir rules. Memoirs as extended poems. Memoir as revealed through footnotes. Memoir as an index. Memoir as blank pages. 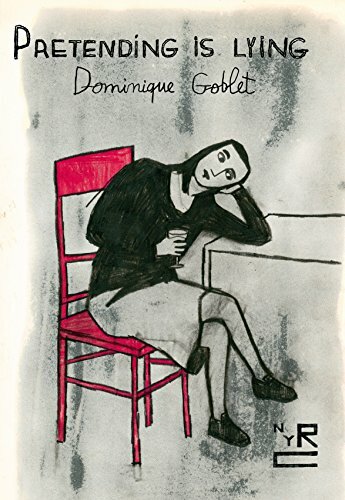 I now have in my possession a new addition to that bag of tricks—a graphic memoir, Pretending Is Lying, by the Belgian artist Dominique Goblet (Dom). Co-translated by Sophie Yanow, the book also features contributing language from Guy Marc Hinant, the Belgian poet, music producer, and cinematographer who appears in these pages as a troubled and troublesome character—and as Dom’s lover. He’s unsavory, this Guy Marc. He’s the lover who breaks Dom’s heart, who is oblivious to Dom’s pain, who obsesses to the point of tedium over his own life and needs. He can go on and on about the making of a simple meal or give an impromptu lecture on a hypothetical encounter between Brian Wilson and Thomas Pynchon. He can complain about Dom’s jealousy while sneaking around with a former lover. He can be self-righteously selfish. Guy Marc also serves as an interesting foil to the other primary male figure in Pretending Is Lying—Dom’s neglectful, alcoholic, self-engrossed, essentially monomaniacal father. Dom’s father is the sort who can scream (and does): “I gave you everything. I did everything for you!” He can call himself a “good father,” even as he is reminded of the cruelties Dom endured as a child. He can alienate his daughter, even as she worries about his health. He can create a world in which his granddaughter can’t feel entirely safe. He utters the words that form the title. In neither men does Dom find comfort. She lives (in the pages of this book) in constant agonizing, frequent tears, and in the throes of beautifully illustrated migraines. “Memoir in which the villain helps remember and shape and even write his own villainy,” I will say to the class, when pulling this book from my bag of tricks. And then I will talk about how no relationship is ever fixed and how Goblet does a very fine job of filling her panels with the smudged lines of love. Beth Kephart is the author of 21 books, including six memoirs and Handling the Truth: On the Writing of Memoir. An adjunct faculty member of the University of Pennsylvania, she is also the co-founder of Juncture Workshops, which can be found online at www.junctureworkshops.com.